In this simple guide we will show you, step by step, how to cut open and remove the seeds from a pomegranate. There are several different ways of doing this, however, we think this is the most easy and least messy way of doing it. Many people simply just cut the pomegranate in two pieces and use a wooden spoon to knock on the outside shell of the pomegranate. This way the seeds are supposed to fall out – we both don’t like this method. First; because we don’t think the method is that effective, the seeds simply don’t fall out that easy. Second; the method can be very messy, you risk getting the pomegranate juice all over your kitchen table and it can be hard to get it off if you let it dry. 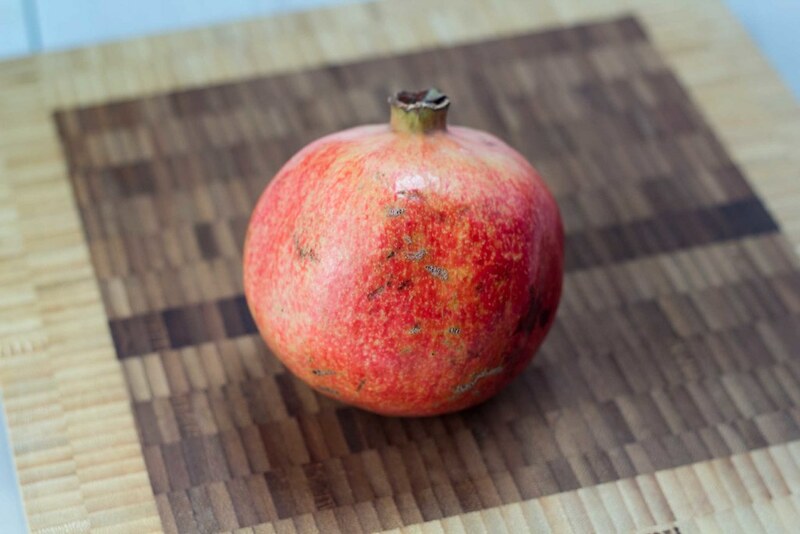 This guide shows how to remove the seeds from a pomegranate the easy way and how to avoid getting the juice all over your kitchen. 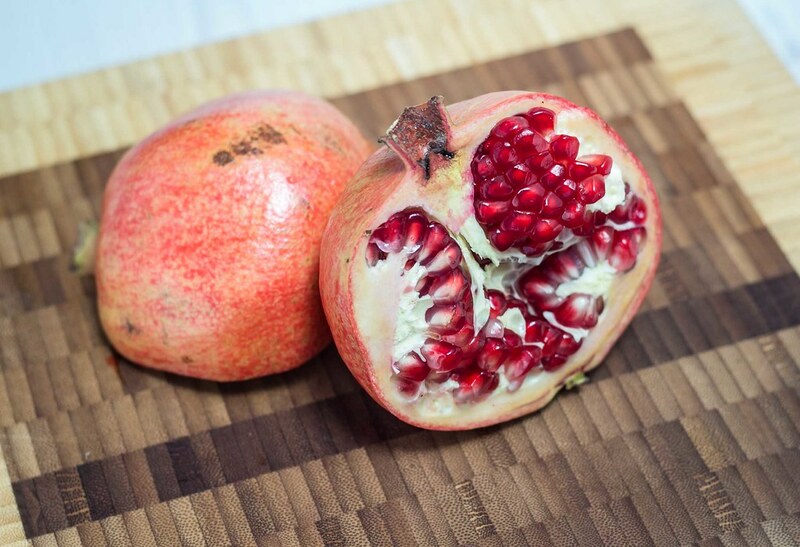 The method is pretty easy – you start by cutting through the shell of the pomegranate and divide it in two pieces. Then you submerge the two pieces in a bowl filled with water and use your hands to break out the seeds. 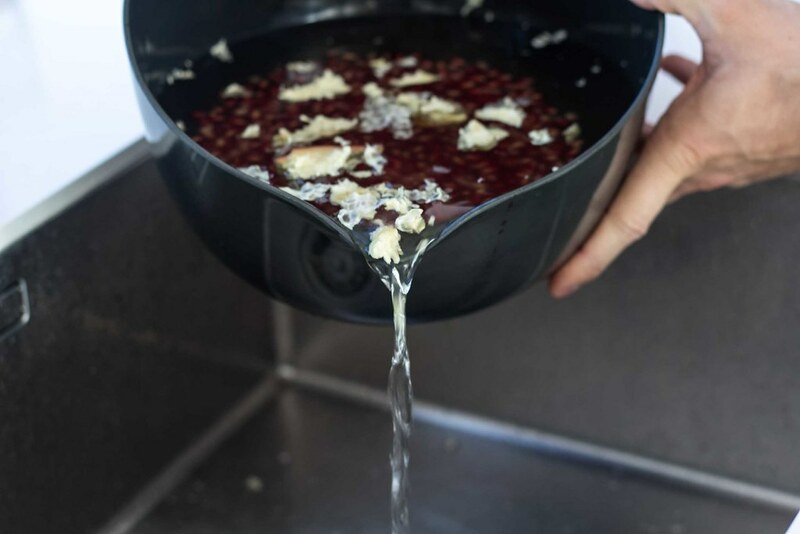 This way the juice will stay in the water and because the seeds are heavier than water they will sink to the bottom and the fruit meat (which is inedible), which is lighter than water, will float to the surface. Then you can easily separate the seeds from the fruit meat. Step 1: Use a knife to cut though the shell of the pomegranate. Only cut just through the shell – this way you don’t damage the seeds. 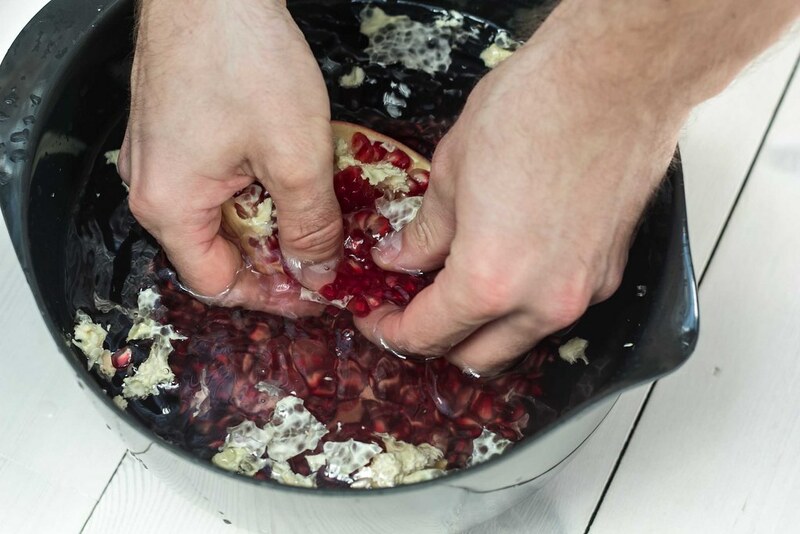 Step 2: Use your hands to break the pomegranate into two pieces. Step 3: Fill a large bowl with cold water. 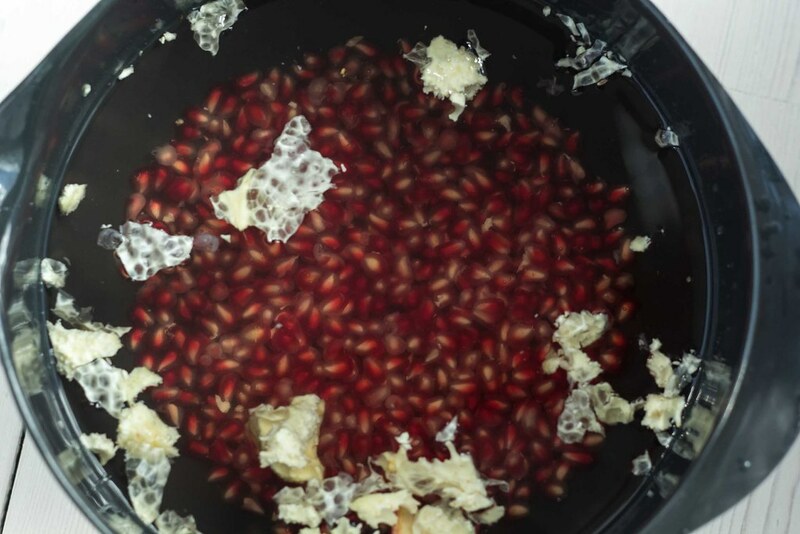 Step 4: Submerge the two pomegranate pieces in the water and use your hands to break out the seeds. Step 5: Because the seeds are heavier than water, they will sink to the bottom. The fruit meat, which is lighter than water, will float to the surface. The fruit meat is inedible. 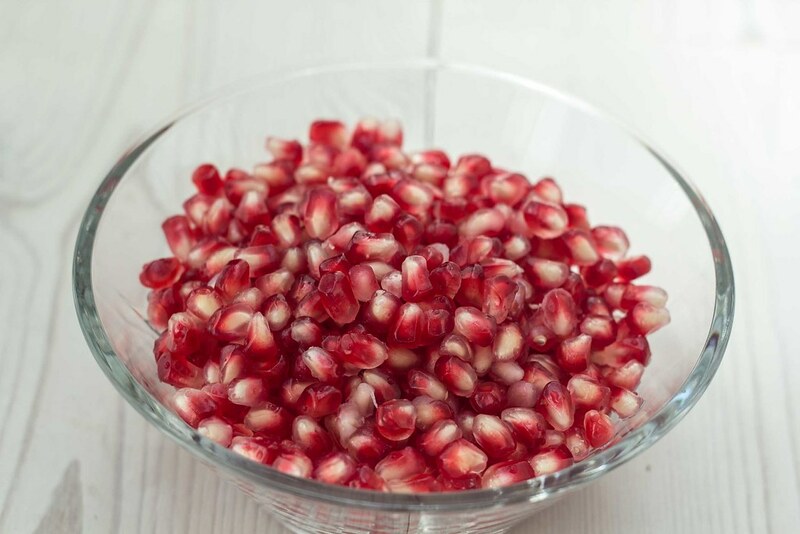 When you have removed all the seeds from the pomegranate simply pour away the water, together with the fruit meat, from the bowl. Step 6: Take up the nice and clean pomegranate seeds.